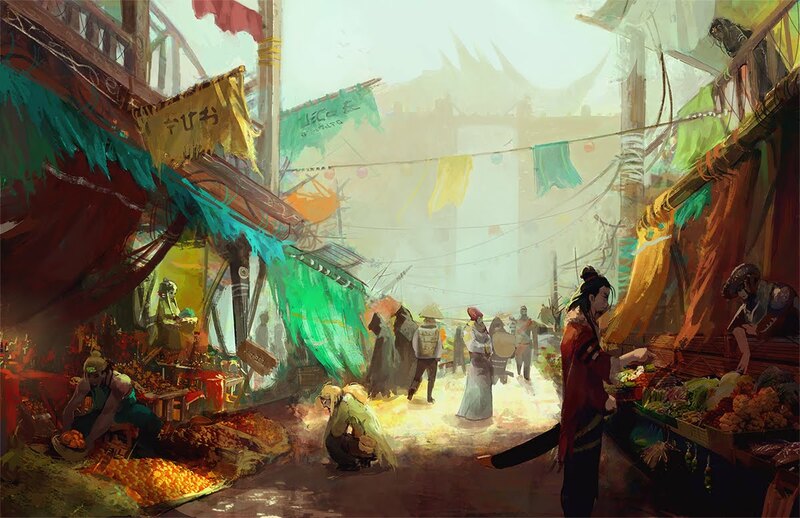 The Throat is the commercial district comprised of everything from bazaar-like clusters of brightly colored tents, to raised auction blocks, to looming guild halls built of polished Tarrasque bone. The following is a selection of random encounters for a party travelling through this zone. On a roll of 3, Roll again. While otherwise engaged (with the results of the second roll), the party is attempted to be pickpocketed. Use the burglar stats for Pathfinder for the pickpocket | 5e use Spy Stats. Recognizing the party as adventurers (or having heard of their exploits) a grippli bard named Xuzay offers to spend a week comprising an epic poem praising the party (for the nominal fee of 100gp). If they turn her down, she instead immediately produces a dirty sing-song limerick mocking one or more of the party members, which the party will hear randomly for months to come. See this list for inspiration - find a good spot to replace 'once was a _' with one of the PC's names/class/descriptions.